I was checking out my stats this evening and noticed that I had over 1000 visitors today which was a huge surprise to me. So I check out the search results and find that fifteen year old Brittney Exline is the subject of hundreds of searches. 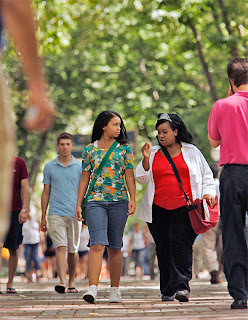 I mentioned Brittney in my blog back in May when it was announced that she was the youngest African American female ever to be accepted to an Ivy League school. Well school starts for Brittney this week and a couple of news sites have stories about her. The Associated Press has an article about her today. Brittney Exline is too young to vote, drive a car or go to an R-rated movie, but at the age of just 15 she is beginning her Ivy League career Wednesday when classes start at the University of Pennsylvania. She said she doesn’t really notice the age gap between herself and her 17- and 18-year-old peers — and neither do they. Exline grew up in Colorado Springs, Colo., where at 8 years she was already in sixth grade. By 13 she had finished high school math. She turned 15 in February and graduated a few months later. She’s not preoccupied with how unique her accomplishments are. “I wouldn’t even really realize that if people didn’t tell me,” she said. She excels at math and science and is really interested in politics, so she enrolled in a Penn program that will award her degrees from both the engineering and liberal arts schools when she graduates in 2011. The AP article is also featured in MSNBC and USA Today which includes a picture of Brittney with her mom. CBS3.com also has an article about her. (CBS 3) PHILADELPHIA Kids her age are still underclassman in High School, but one Coloradoan is years ahead, starting college at an Ivy League school in Philadelphia. 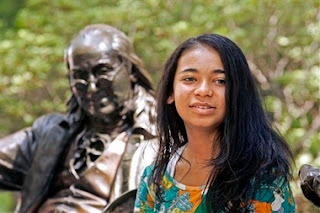 Brittney Exline, a record-setting teen-genius was as anxious as any other incoming freshman on the campus of University of Pennsylvania. The only visible difference is her age. Exline is only 15. “I’ve been three grades ahead since sixth grade,” Exline said. At 15, Exline is the youngest African American female ever to be accepted into an Ivy League school. “All of the Ivy League decisions come out on the same day. So I found out I was rejected from Harvard and wait listed at Columbia, but then when I got into Penn it was really exciting,” said Exline. At two years old the Colorado native was reading. She scored 1400 on her SAT’s and won scholarships and grants to pay her full tuition at Penn where she enrolled in their school of engineering. Math and science are not her only strong point. She’s also fluent in German and with her brains and beauty has won several pageant crowns. But going Ivy League at such a young age certainly tops Brittney’s list of accomplishments. And the young genius admits college isn’t just about hitting the books. Check out the video interview that’s included in the above article. Good luck at the University of Pennsylvania Brittney! !